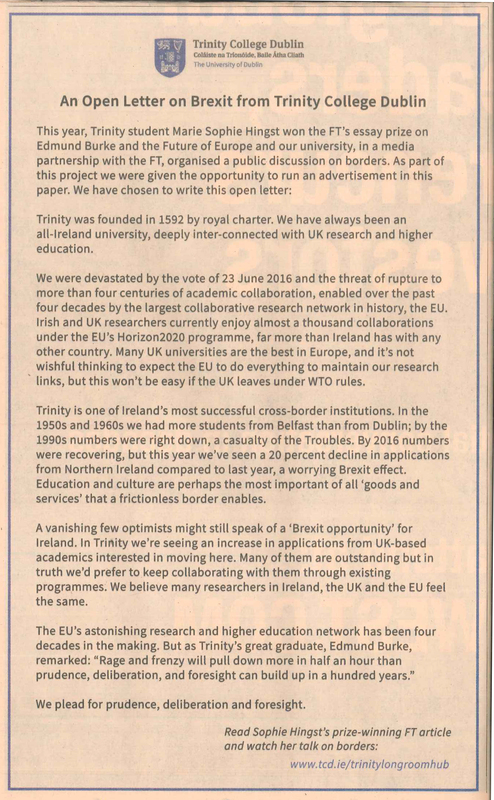 1 November 2018 - Trinity College Dublin has published an open letter in the Financial Times today on Brexit and the higher education landscape in Europe amidst the ongoing talks around the terms of the UK’s exit from the European Union. The opportunity to run the open letter is a direct result of the universities’ participation in the Financial Times Future of Europe project which saw the Trinity Long Room Hub Arts and Humanities Research Institute organise a Behind the Headlines public discussion on the Future of Europe and its borders in a media partnership with the Financial Times. This resulted in a free advertisement opportunity in the Financial Times. 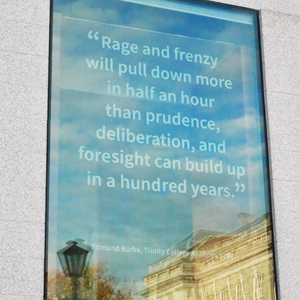 The letter which is available to read here, outlines a quote from 18th-century philosopher, historian and politician and Trinity graduate Edmund Burke, ‘‘Rage and frenzy will pull down more in half an hour than prudence, deliberation, and foresight can build up in a hundred years.” This quote is also the latest display on the Trinity Long Room Hub feature window facing on to Fellows Square and passed by thousands of people each day. It speaks of the strong research network which has been built up over the past four decades “by the largest collaborative research network in history, the EU,” and the “threat of rupture” Brexit now poses to these hard won collaborations. 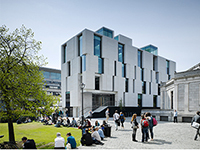 The Royal Irish Academy, Ireland’s leading body of experts in the sciences, humanities and social sciences, established a high-level Brexit Taskforce in March 2017 to consider how the higher education sector could be impacted by UK’s exit from the EU. In a survey of the academic community on the island of Ireland they reported (out of 390 responses) strong levels of agreement when asked if Brexit would have a significant impact on Higher Education and research on the island of Ireland. Respondents also believed that Brexit negotiations should secure future UK participation in EU research and innovation programmes. Read Sophie’s essay, published in the Financial Times, here. Also speaking at the event were senior Irish diplomat Rory Montgomery, Financial Times columnist Janan Ganesh, Financial Times business editor Sarah Gordon. The discussion is available to watch in full here. 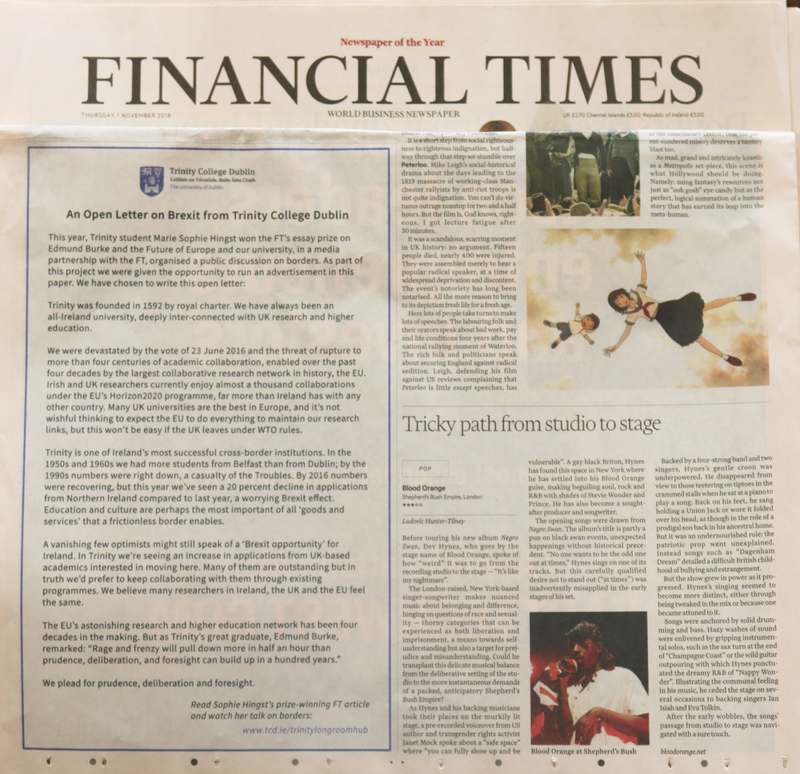 The open letter in the Financial Times today also coincides with the Trinity Long Room Hub’s Annual Edmund Burke Lecture which was delivered by Northern Ireland poet Paul Muldoon on the 30th of October. In his lecture he also draws on the renowned Trinity graduate to discuss the “wonderfully complex world of Edmund Burke”, and how it relates to our own world. “Language is the eye of society”, he said, quoting Burke speaking at Trinity College Dublin in 1747-48. Using language to show the unique challenges of defining what the border means in Northern Ireland, actor Stephen Rea, another celebrated Northern Irish artist, delivered a powerful performance of Clare Dwyer Hogg’s ‘Brexit: a cry from the Irish border’ which appeared on the Financial Times website recently. 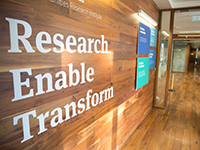 Director of the Trinity Long Room Hub, Professor Jane Ohlmeyer commented on the significance of the letter in today’s Financial Times and "the endeavour of the higher education community to ensure continued collaborations with our research partners in Europe, the UK and across the island of Ireland. 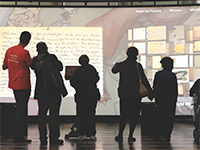 To paraphrase Edmund Burke we need to act with 'prudence, deliberation and foresight.'"